New release from the Spassov who almost in a single breathe manages to bring out the soul in both folk and jazz music. 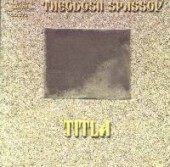 On 'TITLA' he is joined by many of the best musicians in Bulgaria. The title 'TITLA' means hard soil and is from the Kostenets dialect. The concept of the CD cover is Spassov's own and contains a small pouch of soil. The soil being from the village of Kostenets, Bulgaria.